Do not be surprised if we meet. Let us make this National No Slides Week. I recently gave a presentation on photography but I did not show a single picture. I decided not to do one of those horrible presentations I hear about. I did not want to make people sit in uncomfortable hotel chairs eating bad food and endure another Powerpoint presentation. There is nothing more boring than a presentation about change where nothing happens. Instead there was a conversation with the audience. The result was one of the more interesting evenings I have ever had. We talked about change and how to survive and thrive. We learned from each other. It was communication in its simplest and best form. The food was great but the conversation was better. If you are going to give a presentation soon, find the courage to try it without slides. Time to pay your fair share of taxes. Don’t you wish everybody did? Support the Buffett Rule of at least thirty percent income tax for the one percent. Another idea was put forth in the September 28, 2011 New York Times by French foreign minister Philippe Douste-Blazey and promoted by David Brin. They support a small tax or fee on the billions of financial transactions or machine trades made by big corporations every year. The Easter bunny and chicken eggs? Somebody needs to brush up on their biology. The economy is recovering but lots of companies are out of practice in hiring good people. Here is one story. A friend was looking for work. They sent a new company a resume. Their HR person sees my friend’s resume and forwards the resume to a hiring manager. The manager asks the HR to set up a phone interview. The friend has an old land line number with an answering machine. This is the number on the resume. It is used for messages, that way recruiters do not bother my friend at work. Clients get priority over recruiters. When the HR person sets up the interview, my friend emails back that the hiring manager should contact them at their cell phone number and not the landline number on the resume. This is mentioned not only in the text but in the subject line of the email. When the appointed time rolls around, the hiring manager calls the land line number and leaves three messages over ten minutes. He does not leave his phone number on any of them. Meanwhile my friend is frantically checking these useless voicemail messages and sends a message to the HR person saying “Did you give the hiring manager my cell phone number?” The HR person then actually reads the email from yesterday and passes on the correct phone number. The phone interview got off on an awkward point and went downhill from there. If your company is hiring, the first person you should hire is an experienced recruiter. Someone who actually reads email. They should be able to not only get a candidate’s contact information but make sure they have the hiring manager’s contact information in case there is a breakdown in communication. My friend decided to go to a competitor. Their hiring manager called directly. They talked shop for an hour and then closed the deal right there and then. Talent attracts talent. Here is an odd story. A year ago, John Doe of Some Company spoke at an event. The sign in front of him said “John Doe of Some Company.” His name tag said the same. He gave me his business card that said “John Doe of Some Company.” I took his picture, wrote about the event and moved on. A year later, he says he was not affiliated with that company, despite being identified on the web, placards and business cards. I should say the company has been in the news. They do creepy things with social networking data. I’d love to know what happened, wouldn’t you? Guess I’ll have to find out. I ran into someone last week who said they were fifty-nine and a half years old. He told me he was old enough to qualify for some tax benefit, but it made him sound like a seven year old, I mean, a seven and a half year old. I guess having a little extra seniority might give you an edge at both ends of your life. I wonder if the tax benefit is an extra cookie? People wonder where I take some of the pictures on this website. Most are taken in rather ordinary places. Many people walk right past them. Pictures are like opportunities, you have to be looking for them. Another Feb 29th is upon us. Adding a leap day at the end of February every fourth year seems particularly silly. It makes you wonder if there is a better way to measure time than sixty seconds to a minute, sixty seconds to an hour, twenty four hours to a day, seven days to week, four weeks to month, twelve months to a year? It isn’t until we get to a century that we have anything that even remotely resembles the metric system. If only there was time to come up with a better way to measure it. I want everyone who sent congratulations since STC announced my becoming Fellow last week to know that I am grateful. I’ve been named fellow at other organizations, but STC was more central to what I actually did. I cover technology and the people who create it. People want me to write a book about it. How I got here is quite a story. I did want to honor the memories of two late great members who helped me, STC Fellow Dart Petersen and Associate Fellow Viki Maki. They helped build a future that they would never see. We all do. Note: Despite their delightful conversations, tell Patti and Selma Bouvier it is time to go back inside and get away from the bugs. Take nine steps right now. Watch your step. My friends will be eager to meet with you. This week the Susan G. Komen for the Cure foundation announced it would stop funding breast cancer screening at Planned Parenthood clinics because it was under investigation from Rep. Cliff Stearns (R-Fla.). After the public outcry, they reversed their decision. I have lost many friends to this disease. This brought up several points about helping people fighting catastrophic illness. 1. Rather than donate money to one non-profit to another with the loss of funds to administrative costs, why not donate directly to the organization that directly helps people? 2. Consider directly helping people you know suffering with catastrophic illness. Drive them to and from their medical treatment or grocery shopping. If at work, find a way that they can keep their jobs and health insurance. 3. Find out which politicians support ordinary people’s access to health care and vote for them. Rep. Cliff Stearns (R-Fla.) and his supporters have great health care. We should too. 4. Get tested at Planned Parenthood. They care about you. Rep. Cliff Stearns (R-Fla.) clearly does not. A friend of mine has died from Alzheimer’s disease. She and her husband were from two different countries yet they found each other at an American university. Unable to get legally married back East in the 1950s, they moved to Silicon Valley and built a life together. They helped many people. The disease progressed slowly and painfully. I saw it in the photographs. If memories are all we have at the end, what if these are taken too? It was hardest on her husband who took care of her right up to the end. He said this is what the marriage vows mean when they say “in sickness and health.” He said if people stopped taking care of each other society would fall apart. He searched the world for her and lost her in his arms. I’ve just finished reading more bad news about Foxconn. How can you do business with a company that is driving people to suicide to make money? The lowest price turns out to be the highest price of all. It makes you think twice about buying a smartphone. I have not bought one. STC Fellow Richard Mateosian says I won a Touchstone Award. I think it was for those banners I mentioned last week. More details to follow. I belong to a lot of organizations. For an organization to survive nowadays it should be flexible and inclusive. The key to success is to be open to different ideas, people and ways of doing things. One of organizations I belong to is the Society For Technical Communication (STC). A few months ago I was invited to run for the Nominating Committee. When I saw who the other candidates were, I was happy. I knew these people and thought that any one of them would do a great job. No matter who won, the members would win too. Three candidates gave testimonials that were used as banner ads on the STC website in a random rotation. Essentially these ads might appear as political ads for the candidates. The ads were temporarily pulled offline and all candidates were told that they could submit an ad. I create banners all the time. 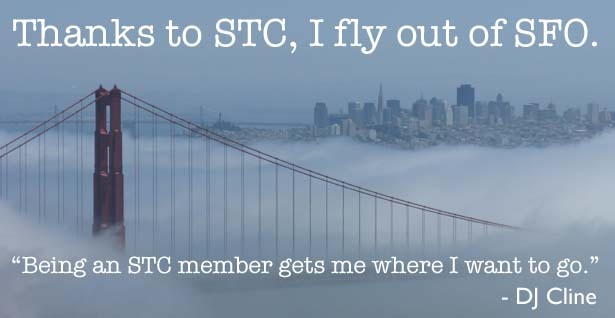 I picked one of my aerial views of San Francisco and the Golden Gate Bridge with the tagline “Thanks to STC, I fly out of SFO.” I quickly submitted the ad. It was rejected. The ad apparently must look the same as all the other ads. I had always thought that the way to get ads noticed was that they stand out. I was told the ad must have your picture and your signature. I have an ugly mug, and I thought most people would prefer to see a my work versus my face. I also have to question the wisdom of putting your picture and your signature online. After all, what could possibly go wrong? I asked if the ads could be pulled offline until after the election. They could not do that. Apparently there are only six testimonial ads and removing three ads would be too much. I was saddened by the thought that out of six thousand STC members there were only six ads. Over the years I have known at least a thousand members who have gotten a job through STC. I know, I was often the employment manager who put up the ad. There should be thousands testimonials on the STC website and they should all be as different as our members. Hang on to your hats, it is going to be a very bumpy year. Whatever the reason celebrate the season! It is a week before Christmas in California and I have just turned on the furnace for the first time. Last year it was turned on at Thanksgiving and before that it was Halloween. Either my place is really well insulated or the weather is getting warmer. Oh well, guess I’ll hit the pool. This blog’s memory requirements are high because of all the content, particularly the pictures. If I’m going to add video, I’ll need even more. It is time for bigger things. When I started this latest incarnation of Blumbers six years ago, people asked me why I chose a picture of clouds. I said at the time that most computing would be in the cloud. That day has arrived. It is time to contemplate a new picture. There is an old saying that you should never own something you can’t carry. If it is three o’clock in the morning and you are carrying a big screen television in a dark parking lot, maybe you are watching way too much television. Of course that old saying doesn’t explain the people out there waiting for new cell phones. There is always the question of whether you own something or it owns you. Publishers are talking to me about doing books. Real live books on paper and online. I have several ideas but have not made up my mind. I’ll ask you, what kind of book would you want to see? I was at diplomatic event the other day and someone asked if I was English. I have no clue why they thought that, but it made me giggle. I wasn’t even carrying an umbrella. Several years ago I was an officer at a non-profit and our treasurer suggested we move our funds from a big bank to a federally insured credit union. She said it would help the local economy while getting a higher rate of return. We followed her advice and were happy with the results. Even if the banks are too big to fail, it does not mean the rest of us are too small to win. If you have any money, move it closer. Vote with your feet. Text Next To Be Exed? With the introduction of Siri on Apple’s new iPhone, I wonder of we are seeing the death of text. The move that started with using a mouse instead of a keyboard has moved to touch screens and now voice commands. For a long time technical communication was dedicated to observing a procedure and converting it to text because pictures were hard to reproduce. The user read the text and had to visualize the process. Desktop publishing made it easier to include pictures and now the web makes it easier to use video. I was at an IEEE event in Stanford and they said that soon 75 percent of web content would be video. If you want to explain something you will just post a video and show someone how to do it. One hurdle will be building simultaneous voice translation apps. We are getting closer to Douglas Adam’s Hitchhiker’s Guide and Babelfish every day. There is a sad part to what I do. When someone famous dies, I know somebody will call and ask if I have any pictures. Considering the sheer number of pictures I take, the odds are that I do. My response depends on who it is. A news organization has to play by the usual rules, but for family members I try to find as many images of that person as I can and just send it to them. I know their pain. When I cover an event, I now try to take pictures of couples and family. I am happy to use their own cameras to get their picture taken together. I know that someday they will want these shadows that are all that is left of someone they loved. I was at a college and saw a picture of a graduating class from a hundred years ago. Everyone in that picture was dead. All that was left of them was their picture, a shadow on the wall. Some people say I take a lot of pictures. They don’t understand that I am trying to capture shadows before we become shadows as well. There has been a lot of talk about how Apple will continue without Steve Jobs. As John Gruber has said, Apple was his greatest invention. I think the organization he built will be fine. Good leaders attract followers. Great leaders attract more leaders. Succession is the mark of success. This is a work of fiction in honor of Steve Jobs. My boss was in the trunk and I was running out of time. It was not what you think. Somebody asked how I got my first Mac. It’s complicated but I think you’ll understand once you’ve heard the whole story. The first summer out of high school the family taking care of me lost their farm. Not much future in farming. The old man had a heart attack and died and the old lady followed soon after. I was on my own and knew it. I planned to work my way through college, looking for any job to pay the bills. The 1980s were not happy times in the Rust Belt. Factories were closing and lots of people were out of work. I managed to get a summer job at the Woodland Factory in a small midwestern city. They made machine parts, bearings, lathes that sort of thing. It was a huge plant, with a couple of dirty old brick buildings with grimy windows filtering sunlight. I swept floors and made myself useful. They had a print shop run by nice old guy, Arthur Magnus. I learned how to build and run their four-color press. I even learned how to use their composing computer, a big Linotype. That computer was in the back of the Admin building. Built in 1939, the structure was a yellow brick Art Deco building with lots of glass brick and curved walls. The lobby ceiling was a mural in the Social Realist style depicting big burly workers welding and grinding industrial equipment. Most of the secretaries had green metal desks in an open space, but the managers had big offices with wooden paneling. I’d come in at night to use the computer, backing up projects on tape and running the job overnight. I’d see the managers in their offices arguing or sweating over something and knew that business wasn’t good. I wasn’t surprised that they laid-off a bunch of people that winter. The next summer I got another job there, but it wasn’t a happy experience. The factory was closing and they were selling off the equipment a bit at a time. I was hired to take some of the equipment apart and put it in crates to be shipped somewhere. That winter the factory closed. Hard to believe, but I worked there again the next summer. The company that bought the property wanted to develop the land the factory was on. Unfortunately the buildings had asbestos in them and it had to be removed. They contracted out to another company and they hired me to help because I knew my way around. They gave me a big ring of keys for every building in the complex as we got to work. It was hot and dirty work, sweating in those suits and wearing a mask, but it paid the bills. That proved to be a bad summer for everybody. The company that tried to develop the property couldn’t pay for all the clean up and went out of business. My last paycheck bounced. That winter the apartment building I was living in was condemned and I couldn’t find another place. I was packing up my gear and then found that big ring of keys I’d forgot to turn back in at the end of the summer. Frankly, there was no one to turn the keys over to. I should say that I travel light. Most of my life I’d traveled from home to home with most of my possessions in one suitcase. I try to make do with what I can find. The most expensive thing I owned at that time was my car. It was a used 1970 Ford Pinto hatchback. Go ahead and laugh, but it was paid for, about $150. It started in the coldest weather and used very little gas. You lifted up the hood and saw a sewing machine-sized engine and not much else. It was so simple you could fix it with used parts. The reason I got it so cheap was that it had been hit in the rear and Pintos were known for exploding when hit that way. I figured the odds were good that it wouldn’t be hit twice and spent my money on extravagant things like tuition and peanut butter. So I packed up my gear and drove my car through the abandoned factory gates on a cold December day. I parked in the president’s old space, grabbed my gear and sleeping bag and walked in the front door. All the furniture was still there, like they were expecting to come back. Filing cabinets, photocopiers, and cafeteria, everything in place. Even the power was still on, though I don’t know who paid the bills. When a whole society and way of life collapses, little details like checking the meter get lost. I moved into the president’s office because it had a small bedroom with a full bathroom. Lord knows why he needed that. I guess upper management work some long hours. Of course there are some things about management I prefer not to know. For me this was living pretty high on the hog. Not many college students had unlimited access to electric typewriters and copying machines. My term papers were printed out in the president’s heavy bond paper, giving them weight and an air of respect. I knew my situation, like all situations, was temporary. I had finished my shower one morning and was toweling myself off when Arthur Magnus walked into the bedroom. Art was the guy who taught me how to use the composing computer. I thought he had been let go along with everybody else. “What are you doing here?”Art asked. He seemed mildly amused, not angry. “I cut a deal with the city. I’m leasing this building to start my own media company.” He said, bragging like any small businessman. “Great! Need help?‚” I asked as I put on my clothes. “You can if they can live here.” I suggested. And that was the way it started. Art let me keep the president’s office while he moved operations into the vice president’s office closer to the front door. I went to school in the morning and then came to work in the afternoon. I learned a lot about the design part of advertising and media. I learned how to make slides for business presentations. How to lay down soundtracks for commercials. How to edit videotape. I learned how to estimate jobs and deal with clients. I learned how to keep a budget and make a profit. One day he handed me a video tape. I went to school the next day. I told my friend Sam about it. He was majoring in computers. I didn’t see Sam much after that. I spent more time at work, taking over more of the sales and production. Art was calling in sick more and more often. He kept going to funerals for his friends. I thought they were old, but a couple of them were not much older than me. One day the Macintosh and laser printer arrived. I took them out of the box and set it up. Within the hour, I was printing my first layout in PageMaker. I called Art at home and asked if he was coming in to see it. I went over to his apartment and was shocked. It had been a month and he looked thin and was covered with dark blue splotches. “Is anybody looking after you?” I asked. That was the sad truth about that period. Everything was falling apart. Farms were failing. Factories were closing. I had heard that in hard times people in the community would move in together and share expense or take care of each other. This epidemic was too big. I wasn’t afraid. Hell, I grew up surrounded by agricultural pesticides and worked with asbestos, I wasn’t going to let this scare me. So I took care of Art as part of my job. He continued to give me advice on running the business as he faded. I’d like to say the business was doing well, but it was Art’s relationships with clients that worked. It was as if Art was more important than the work he created for them. I was just his assistant. They wanted Art. By the spring of my senior year in college, Art was so sick he had to go into the hospital. They treated him like he was radioactive material. The hospital staff wanted to know my relationship with him. They asked with a slight sneer. I said I was his nephew. After all, no one would do this for his boss. Hard times made most people see bosses as the bad guys. Maybe some were, but Art gave me the freedom to learn things they never taught in school. I can’t remember a single line of bull from my business classes, but I remember everything he taught me. I got a letter from the city saying that the lease on the Admin building would not be renewed. They were going to ’implode’the buildings, which meant they were going to blow them up in a controlled manner in about two weeks. I had the letter on my desk when the hospital called and told me Art was dead. They wanted to know if I wanted to pick up the body. I had given this some thought and done some checking. He was a decorated war veteran but the people at a local military cemetery freaked at having someone with this disease buried there. I checked with various private cemeteries and funeral homes and got the same panic response. Gee, he’s dead, people. He’s not going to date anybody. Shame on them. Then it occurred to me. I knew of a place that wasn’t Potters Field. So I went to the loading dock of General Hospital and there he was, in a black body bag with red-orange biohazard tags and stickers on it. I went inside and confirmed it was okay to take it. No one would help me move it. I opened the hatch of the Pinto, folded the back seat forward, Moved the bag to edge of the loading dock, got down put the bag over one shoulder and eased it into the car. This is how I wound up with my boss in the trunk. I drove out to a small town near my old farm. They had a Quaker cemetery that would bury anybody. Funny how folks without weapons aren’t afraid of anything. So that is where Art is buried, decorated war veteran surrounded by conscientious objectors, abolitionists and peace activists. Their wars were over. Mine had just begun. I went back to the Admin building and figured out what to do next. I wrapped up the rest of the outstanding projects and delivered them to the clients. I finished my final exams and picked up my diploma, not waiting for the graduation ceremony. The company hired to implode the buildings hired me to show them around the buildings while they set the explosives. On the day of the implosion, I packed up the Mac and the printer Art had left to me. I figured I could use them as a foundation for a new business. They barely fit into my car. I took my old sledgehammer from the asbestos removal days and swung it through the glass brick window of the Admin building just for Art’s sake. As I drove out of town, I heard the muffled explosions as one building after another collapsed behind me. My future was in front of me. In 2004 I was at one of those twentieth anniversary events for the Mac in Silicon Valley. I had set up my original Mac and printer for display. My old college friend Sam walked up. “Still have that Mac?” He laughed. “Not only that. It still works. Do you?” I smirked. “You ever get a full time job?” He half-mocked me. “ No. I’d rather work for a living.” I full-mocked back. When the event was over, my assistant packed up the boxes and loaded them in the trunk of my Mercedes. The license plate said BOS N TRNK. In all the technological chaos, it is hard for large companies to change strategies and tactics and keep an eye on their goals. Amazon started selling printed books (content). To sell the books they mailed them. To keep track of everything, they built their own cloud network. Now they sell digital books over their cloud network on their own Kindle devices. This is an excellent example of how a large company can survive by changing the way they do things but not their goal, to sell content. HP has a great tradition and good people. They support a number of projects in communities around the world. I have used all sorts of their products for years. Lately HP leadership has made some decisions that has a lot of people worried. This week Meg Whitman was named CEO of HP. I do not know if this will stabilize the situation. To avoid these messy transitions, somebody proposed that HP choose CEOs randomly from among its many happy customers. Every time it needs a new CEO, the board could select a random serial number from one of its laptops, tablets or inkjet printers and announce it on the home page of their website. I don’t know if it would be better, but it couldn’t be any worse. All of this makes me wonder if financier Carl Icahn will show up. Like Martin Blank in the film Grosse Point Blank, if he shows up at your company there’s a reason. If your company has failed to address the needs of customers, investors, employees, or even former employees, Mr. Icahn is the one to call.